I thought it would be helpful to create a recommended products resource page that you can always come to for all of your financial, blogging, and other needs. I’ll add to it as I learn more, but you’ll notice that in the future I will reference this page quite often. I recommend bookmarking it for your reference and convenience. Enjoy! Please note that some of the links below are affiliate links. At no additional cost to you, I will earn a commission if you decide to make a purchase. Please understand that I have experience with all of these companies, and I recommend these resources because they are helpful and useful, not because of the small commissions I make if you decide to buy something. Please do not spend any money on these products unless you feel you need them or that they will help you achieve your goals. Bluehost is an awesome hosting service for the beginning blogger/website owner. Why? Because Bluehost makes it seriously easy to get your new site up and running quickly with their one-click WordPress Blog installation (Check out my tutorial to guide you). You can install multiple domains in your Bluehost account, which means you don't pay extra when you want to start another website. They also provide excellent customer service. They're even happy to talk by phone when you need it! I highly recommend using Bluehost for your first website, and you can get started now atjust $3.95/month, which is an exclusive deal for Celebrating Financial Freedom readers! A good hosting choice for the more advanced blogger with lots of traffic. Very fast VPS hosting, dedicated servers, and some of the best customer service you can find anywhere. My blog is better, safer, and faster with InMotion hosting! WordPress is the #1 resource to build a blog, website or app. It's open-source and FREE! 29% of the entire web uses WordPress to power their sites. Beautiful designs, powerful features, and the freedom to build anything you want, it's how the web gets done! CFF has been a self hosted WordPress blog since day one- nothing else is better in my opinion! I've been using Mailchimp for email marketing since day one. An easy to use interface helps you get up and running quickly. Awesome automations allow you to build campaigns quickly to keep in touch with your list. Best of all, you can grow into their platform. Mailchimp's “Forever Free” plan lets you send up to 12,000 emails a month to up to 2,000 people for free- every month! Studiopress Themes on the Genesis framework help you build beautiful, powerful sites you can be proud of! All my sites use Studiopress themes! With hundreds of themes to choose from, you can find one that fits you perfectly. Beautiful, affordable, mobile responsive designs with rock solid security and blazing fast performance. Learn more about Studiopress Themes and the Genesis framwork here. Canva is my favorite graphic design tool. I use it for all my images- and best of all, it's free! My favorite resource to create stunning images for social media, flyers, business, cards, invitations, posters, and any other creative media you can dream up! Their free plan is awesome (it's what I use), and they have a professional plan available with more advanced options. Fotolia by Adobe is where I get all my stock images. At a little over a dollar an image, Fotolia is an affordable option with millions of professional photos available for all your stock photo needs. Pay-as-you-go or monthly subscription plans are available. Gumroad is built for creators! It allows you to easily sell your digital products right from your own site. Setup is easy, in-depth analytics keep you informed, and you can manage customers right from your personal dashboard. You can even set up affiliates in your account to sell products for you! Unlike iTunes and Amazon, you get to keep your customers and you're free to control your own business. A valuable resource for the online entrepreneur! 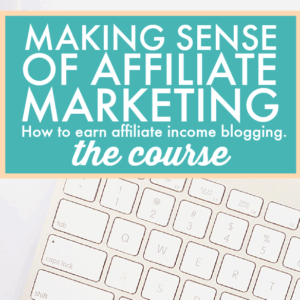 Making Sense of Affiliate Marketing is the bomb! An extraordinary step-by-step guide for making money with your blog even if you're starting from zero. Course creator Michelle Schroeder-Gardner is the real deal, making well over $50,000/month using the affiliate marketing strategies she teaches in the course. I've taken this valuable course myself, and I can tell you it was well worth the money- a great value! Pinterest Presence is an excellent course by my friend Kristen Larsen. She teaches you the ins and outs of using Pinterest to drive traffic to your site, increasing growth and profits in a HUGE way! I've taken this course as well. Even as a seasoned Pinterest user, I learned a ton from Kristen's straightforward strategies. Since taking the course, traffic from Pinterest to my site has grown considerably! Flourish With Facebook Ads is a great way to learn how to make money through Facebook Ads. If you have anything to promote or sell, Facebook ads (if done right) can help you make a ton of money! I've personally taken this course. I learned a ton about how to create and test FB ads to maximize my return on ad investment. Course creator Monica Louie has run hundreds of successful ads for her clients and really knows her stuff. Using Pinterest is a great strategy to drive traffic and revenue to your website. Unfortunately, it can be really time consuming. Boardbooster is a pin scheduler on steroids! Tons of features allow you to fully automate your Pinterest strategy so you only have to spend minutes every month growing traffic from Pinterest. I use Boardbooster in combination with Tailwind to get the best results from my Pinterest strategy. Tailwind is another powerful tool for upping your Pinterest game! From scheduling pins to joining tribes of bloggers pinning each other's pins, you'll grow your traffic more than you ever could on your own. I use Tailwind as a hugely important part of my overall Pinterest strategy. Yoast SEO is the #1 WordPress SEO plugin. The best plugin solution for improving your site structure and making sure your site looks attractive to the major search engines. An indispensible (and free!) resource that'll make your site the best it can be! WP Rocket helps your site run blazing fast! That means more search engine visibility, and more eyes staying on your pages longer. An plugin to get fast, predictable performance. Pretty Links is a free plugin that helps you to shrink, cloak, track, organize, and share short links using your domain name and brand. Free and premium versions available. Thrive Leads helps build your email list fast! Create popups, banners, slide-ins, widgets and more using the simple drag and drop interface. Grow your list exponentially through A/B testing and detailed reports so you know what works best. It's the plugin I use for all my email sign-ups! I've been using the Disqus comments plugin since the beginning. A great commenting system keeps readers engaged and on the page longer. Used on top sites like Rolling Stone and TMZ, this resource is plenty powerful for any site! Quantcast helps you get a deeper view of your audience. Get FREE insights into your audience demographics you can't get anywhere else. From household income to shopping habits and political affiliations, you can find all the intimate details you need about your audience to target the right people for your site. Updraft Plus backup plugin is essential to keep your blog site up and running. Whether it's due to user error, server crashes, or hackers, losing your site data is devastating. Having a proper backup using the highest rated plugin ensures your information is still available, no matter what occurs. Mediavine is an awesome ad manager for your site! They manage all your ads for you, helping you achieve ad revenue that is many times what you can earn with Adsense. You need to have significant traffic to join, but I can tell you it's a first class experience all the way. Currently I'm making about 5-6x the ad revenue I was making with Adsense! Adsense is a good ad solution for sites with less traffic. Easy to implement ads and excellent analytics help you start making money with ads fast. I used Adsense on the CFF blog for years and had a great experience! Last year I switched over to Camtasia for all my video editing, and I couldn't be happier! Camtasia offers an easy to use interface with plenty of features. I especially like the screencasting feature. You can also record “green screen” video, add video and audio effects, and tons more! Download a 30 day free trial here. Audacity is a free, open source audio editing platform with all the features you need to make high quality audio for your site. An easy to use resource for all your audio needs. Since it's open source software, it's FREE! Go here to download Audacity for free. I like Personal Capital for managing every area of my finances. I can budget, plan, and keep track of every investment in one convenient place! If you want to get your money organized, this is the place! You can sign up for free here. Mint is another good place to organize your financial life. I've used them as well, and although I prefer Personal Capital, I believe Mint is a solid performer too. You can sign up for a free Mint account here. Read my post comparing Mint vs. Personal Capital here. I keep all my stock and mutual fund investments at Vanguard. Vanguard is owned by it's clients (that means you!) so they're always working to serve your best interests. Even better, they have the lowest fees in the industry by far! I've kept my investments at Vanguard for well over 20 years now and I've never had a bad experience. I installed two Nest Thermostats in my house several years ago. Since then we've been saving about 10% on our energy bills every month! 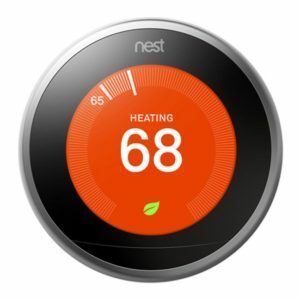 The energy savings paid for the cost of the Nest thermostats in a little over a year. You can learn more about them here. Ebates is an excellent way to earn money while shopping online. You'll get discounts and rebates on everything you buy from thousands of the most popular online retailers. Even better, you can refer your friends and earn bonuses when they shop! I typically average $50-$100 a month in rebates and bonuses. You can sign up for Ebates here. 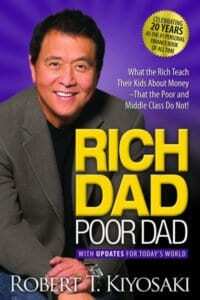 Rich Dad, Poor Dad is the top selling personal finance books of all time. It's one of my all time favorites because it taught me what my parents didn't- specifically, the differences between how average people think about money as opposed to how the rich think about it. 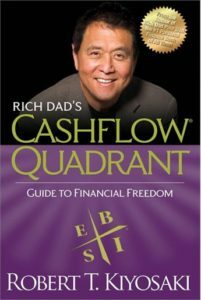 Robert Kiyosaki tells the story of how his biological father (poor dad) and his friend's father (rich dad) had vastly different mindsets about money. Ultimately, he learned that building wealth and freedom comes down to knowing and doing certain things that average people just don't do. An excellent resource guaranteed to change your perspective on money! An easy, entertaining read you'll love! The Cashflow Quadrant is Kiyosake's second book. In my opinion, it's just as mind blowing as his first! He goes into much more depth, showing the four different types of income you can earn, and why some types are better than others. He demonstrates that if you want to truly achieve financial freedom, you have to know how to make money work for you instead of you working for money. I've learned so much from this book over the years. You can find its influence in almost everything I write here at CFF. Financial Peace is where it all started for me. It's the first book I ever read about personal finance, and it changed me in many profound ways. As a young professional just getting started in my career and finances, I learned from Dave's mistakes and decided debt was not for me. Although I didn't stick to that philosophy for the first few years after reading the book, it gave me a strong foundation to work from. Angie and I have had no consumer debt for over a dozen years now, and we owe it all to Dave's powerful story that he lives out every day. Without this book, Celebrating Financial Freedom would not exist. 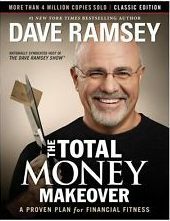 The Total Money Makeover is another hugely popular book from Dave Ramsey. It's a step-by-step guide for getting out of debt, building wealth, and learning to live like no one else. A must read if your goal is to get out of debt! 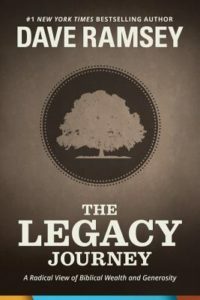 The Legacy Journey is a Dave Ramsey book that explores what happens after you get out of debt and start building huge amounts of wealth. You'll learn what it truly means to be wealthy, and why having a lot of money is not really the end game. Dave explores how financial freedom changes your life, why giving is a great way to maintain your wealth, and how leaving a legacy of wealth to others is one of the greatest things you can achieve with what you have. 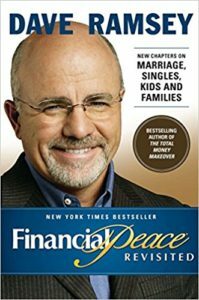 An awesome book to read once you have achieved financial freedom!